U2 Annouces their 2017 The Joshua Tree Concert Tour. The North American Leg of the U2 Joshua Tree concert tour will begin on May 12, 2017, at BC Place in Vancouver British Columbia. The last scheduled performance will be on June 1, 2017, at FirstEnergy Stadium in Cleveland Ohio. U2 tickets at the Pasadena Rose Bowl on May 20th, 2017 will include General Admission seating on the field and reserved seats in the Rose Bowl stands. The Pasadena Rose Bowl Stadium has a capacity of 106,869 for concerts and a 92,542 capacity for a football game. There are sixteen scheduled 2017 U2 The Joshua Tree Tour Dates in North America. 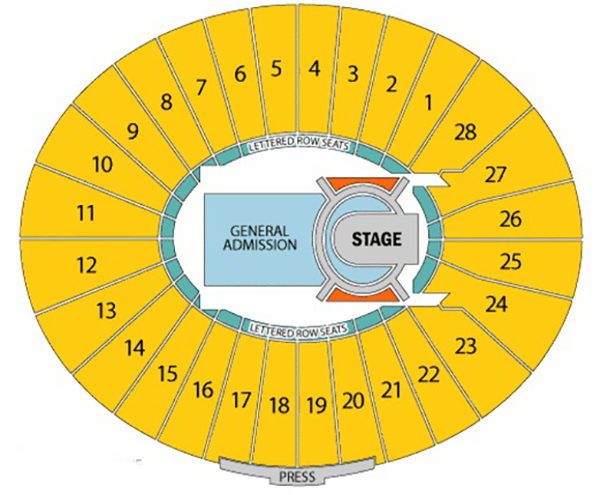 Here is a look at the U2 Rose Bowl concert seating chart. You might also like our Rose Bowl Tailgating guide as well as Where to sit at the Rose Bowl. Random question: I have been invited to see U2 at the Rose Bowl in the General Admission area and I am worried about being able to tolerate the loudness. I have not been to a concert in years and don’t really know what they are like these days. Where is the best place to sit in GA where it won’t be super loud? It’s a bit tough to answer your question as the stage configuration has changed a little bit this week. U2 will be playing on the main stage as well as a bit into the crowd. The easiest answer is to stand in the GA toward the rear of the floor although your view the band might be a bit tougher the sound should be a lot lower. Pack some ear protection regardless of where you are. It’s going to be loud no matter where you are because their live sound people are good at their jobs. Enjoy the show! @Veronica Just bring some comfortable earphones you goof. You could also use cotton balls, ear plugs, fuzzy headphones, no ones gonna care what you look like.